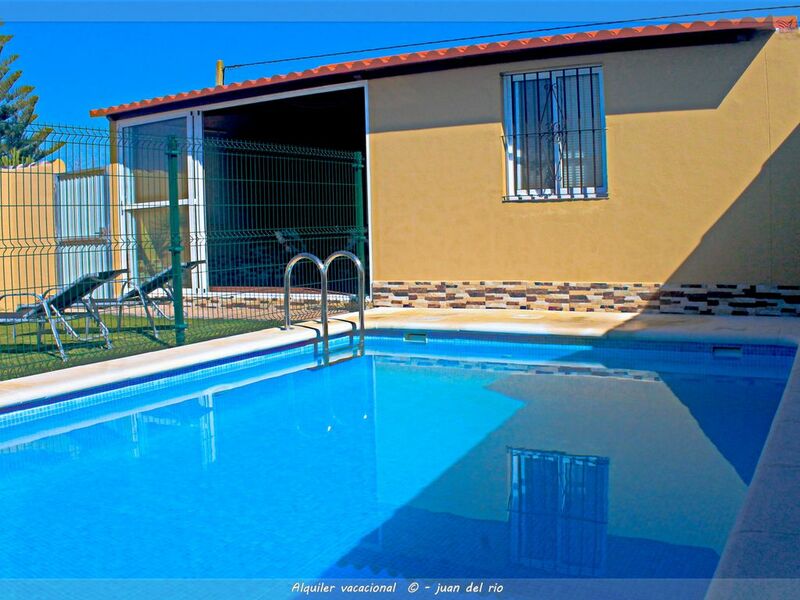 Bungalow for up to five people, located in the area of Barrio Nuevo/El Colorado, about eight kilometres from the town of Conil de la Frontera. In the surroundings there are various local businesses, such as a chemist, restaurants and bars, and Carrefour Express supermarket. The closest beach to this bungalow is the well-known beach and coves of Roche, about six kilometres away, or 10-12 minutes by car. This accommodation has air conditioning and private parking and is made up of two bedrooms, one with double bed and the other with bunk bed, a bathroom with shower and the living room with sofa bed. The kitchen is open onto in the living room and is well equipped. This property is ideal for spending the days in your private pool, sunbathing on the sun loungers in the garden area, where there is barbecue, and a closed furnished porch with glass patio windows.